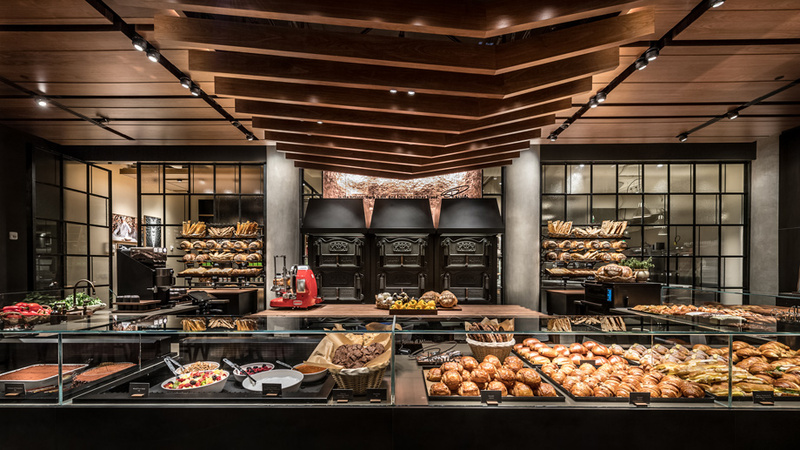 Starbucks flagship store is an open, marketplace-style format that brings together Reserve Roasteries coffee, fresh food from Italian bakery Rocco Princi and full bar staffed by mixologists. 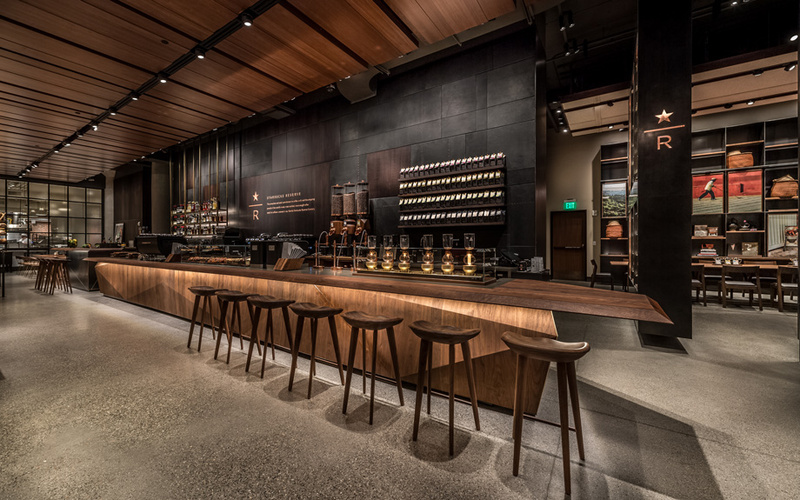 The experience can be found inside the company’s Seattle headquarters and The first-of-its-kind Reserve store was designed to incorporate the theater of coffee making as well as deliver a new take on Starbucks Third Place guest experience (based on the idea that its cafes provide an essential space for consumers—home, work, Starbucks). That all begins with the opening of the massive walnut doors which offer a peek at the interior through a single brass-rimmed porthole. 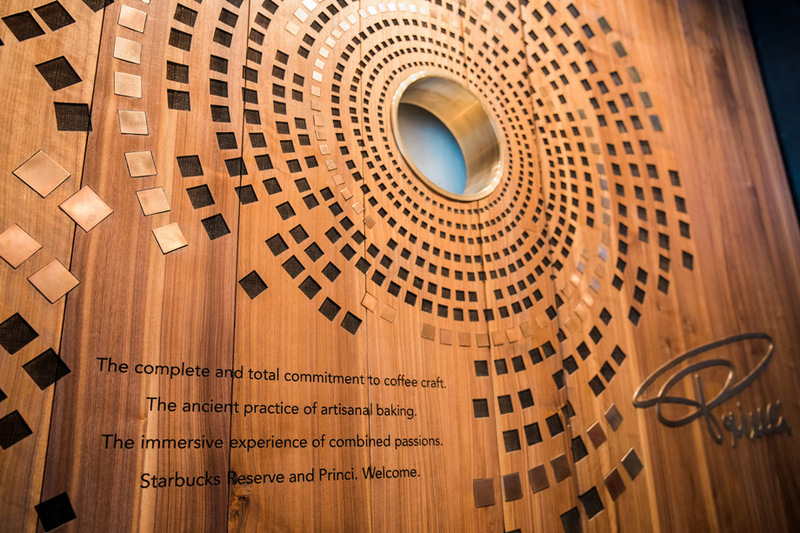 The brass concentric circle pattern is a nod to the art on the Starbucks Reserve coffee card. Guests get a panoramic view of the interior upon entering. There are subtle details in the space to help orient and guide guests to specific areas. The paneled wood ceiling visually separates the seating, retail and service spaces. Scattered in the concrete floor are flecks of amber-colored glass and mirror that create a path to help guide people through the space. To the right is a long wood-topped Reserve coffee and mixology bar. Guests get a clear view of their coffee being brewed and mixologists at work. Attention was paid to making the equipment and stock on the back counter look as good as the food and retail merchandise presentation throughout the rest of the space. Centered in the space is the Princi bakery and cafe. 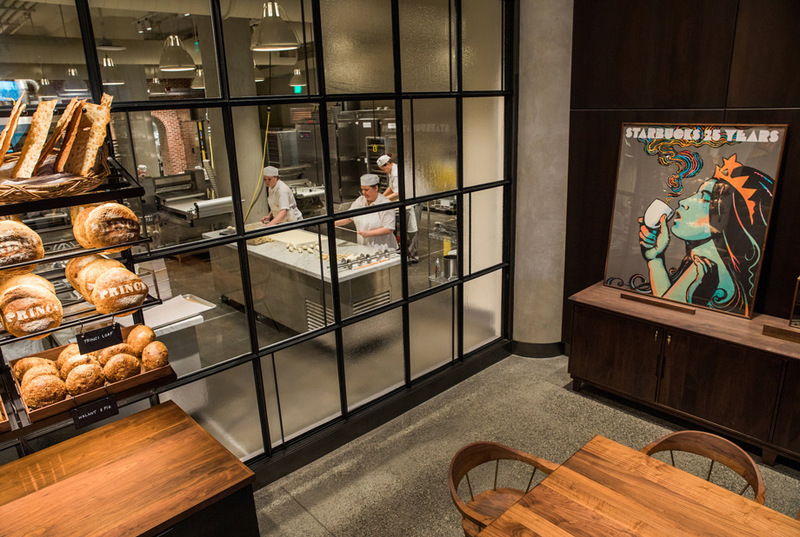 Guests can get a view of chefs working in the prep kitchen and bakery. Adjacent to this is the chef’s table room, an enclosed pantry-inspired dining room. 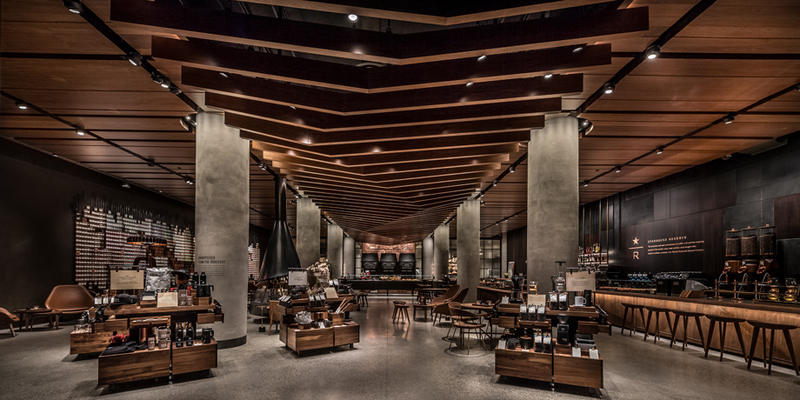 The store represents the latest phase of innovation in the century-old building in Seattle’s SODO neighborhood, which has served as Starbucks headquarters since 1993… The Reserve store [acts] like a testing ground for the company, where it will debut new coffees, launch new products and host events. 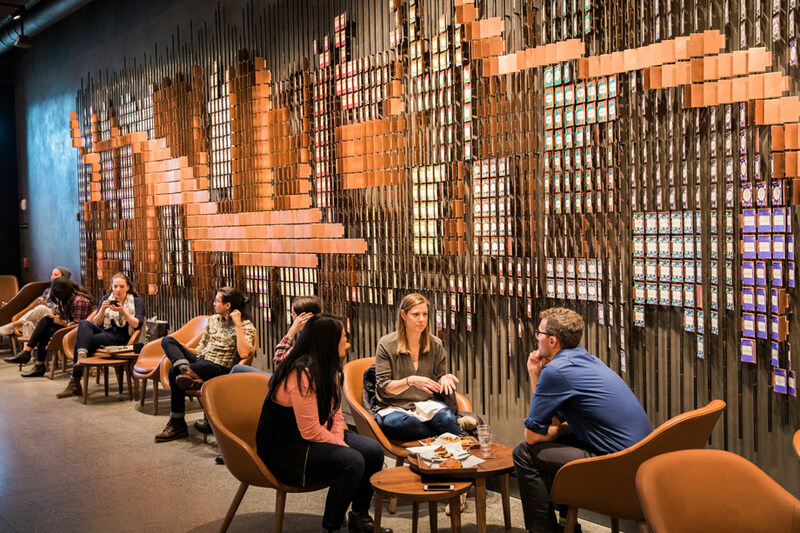 Spanning the entire main lounge wall is an installation made of nearly 3,700 Starbucks Reserve cards. Viewed from a distance, the dimensional mural is meant to represent the topography of mountains where coffee is typically grown. 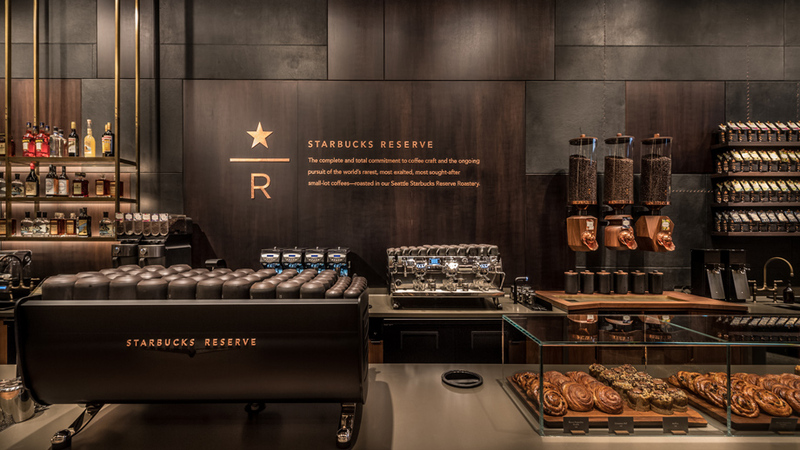 Beyond the making and selling of beverages and food at Reserve, the Starbucks R&D team has a working lab within the store to develop new beverages. 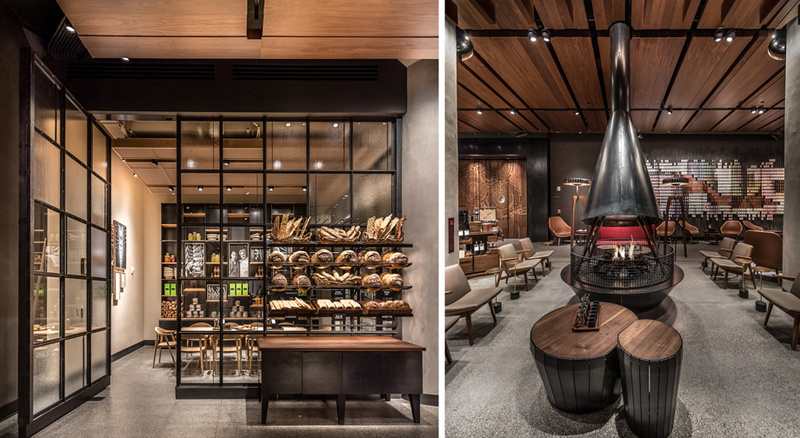 Starbucks plans to open up to 1,000 Reserve store locations around the world. The Seattle flagship will likely be the place were future food and beverage ideas are tested first.